Miami Horror is perfect fodder for illogical humor. scientists in Miami. Female human with powerful ESP that can communicate with aliens and humans. Throw all that together and you got yourself one humdinger of a movie. There is one scene in the movie that the director loved so much, he shows it to the unwilling audience TWICE. 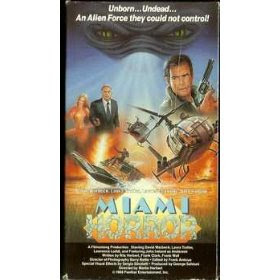 That my friend, I think is why the title of the movie serves its purpose: Miami Horror.